Wendy Augustine, a bartender at Hali‘imaile General Store, knows Mai Tais. 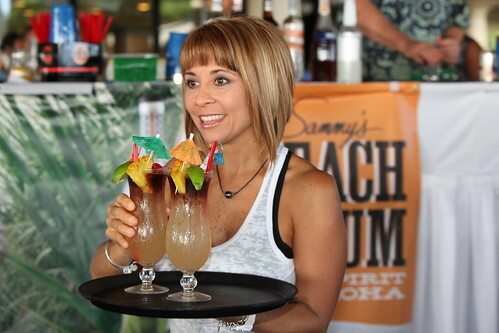 She knows them so well, in fact, that this weekend her special Mai Tai blend won the coveted title of World’s Best Mai Tai, making her the first ever Maui bartender to win such a victory. The Mai Tai is Hawaii’s signature drink. This is despite the fact that the Mai Tai isn’t really Hawaiian or even Polynesian. Despite its poi dog roots, the incredibly popular rum cocktail is here to stay. 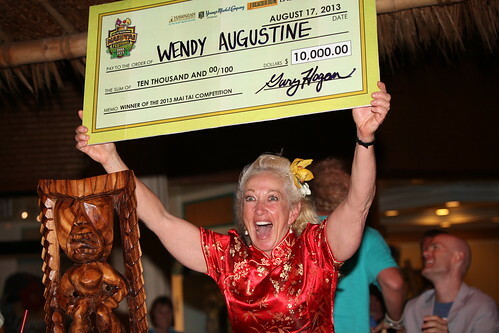 The folks at the Royal Kona Resort, home to the Don the Beachcomber restaurant, and Don’s Mai Tai Bar offer a glimpse of the future of this mythology with the annual World’s Best Mai Tai competition, which took place last weekend. Bartenders fly in from around the state (and a smattering of the rest of the nation) to offer their latest rum creation to the Mai Tai gods. 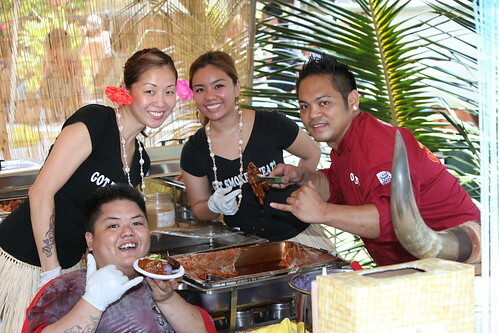 The Mai Tai Festival kicked off early in the day with the Battle of the Barbecue on the Luau grounds of the Royal Kona. There were food booths and a Mai Tai Marketplace with tons of vendors featuring local artwork, crafts and clothing. Newcomer Umeke took first place with their Kona Kampachi Grilled Plate featuring a rice ball and grilled stuffed mushroom while Broke da Mouth took home the Peoples’ Choice Award with their hefty rib, short rib and shrimp on purple sweet potato mash. 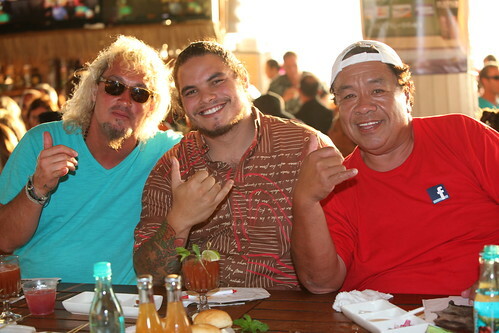 After the battle, Henry Kapono and his band hosted a pool party. It was needed, because the main event consisted of seven rounds of bartender competition for the title of World’s Best Mai Tai. Maui’s own Sammy’s Beach Bar Rum, featuring boutique distilled sugar cane rum from Hali‘imaile, was the rum of the competition. From there competitors incorporated homemade syrups, orgeat, falernum, hops, lychee, lavender, orchid, fernet, dragonfruit, honey and other ingredients into their special cocktails. The key lay in mixing the spirited ingredients to get the perfect balance of nose, palate and finish, which along with presentation, creativity and staying true to form, made up the basis of the judging. 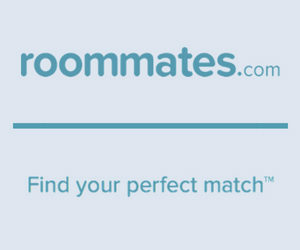 Each judging detail can bring a maximum score of 10 points, and a perfect scoring Mai Tai would be 420 points. 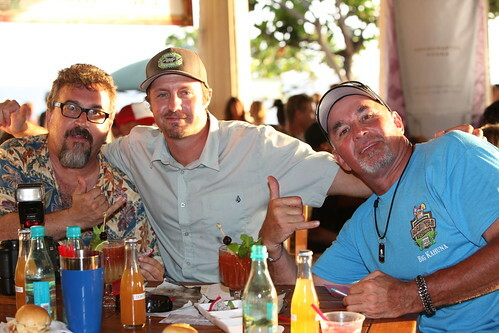 The first Maui contestant to get in the rounds was James Shoemaker with his Red Rocker Mai Tai. In his presentation he brought out six different glasses for his ruby red drink, and garnished it perfectly with mint and lime for good contrast. But it was Wendy Augustine from Hali‘imaile General Store who took home top honors. 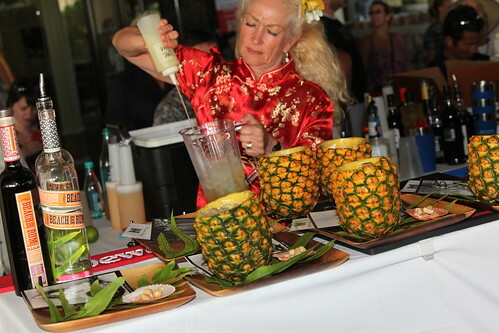 She served her winning entry in a Maui Gold Pineapple, with a “sea shell of macadamia nuts.” She said she drew inspiration from the early days of the Mai Tai and wanted a drink that would take the judges back in time. Her Mai Tai featured fresh lilikoi puree, scratch sweet and sour, orgeat, orange curacao, locally made light and dark rum, fresh lime juice, kaffir lime syrup, fresh lime zest, flash blend and a garnish of lime, pineapple spear and one old style cherry. The drink featured a crushed ice effect, which Augustine said she achieved by building the drinks in a blender. Hali‘imaile General Store is a neighbor of Sammy’s Beach Bar Rum–their distillery is just across the way. Owner and renowned chef Bev Gannon was elated with the win. She said it was a win for all of Hali‘imaile: Maui Gold Pineapple, the distillery and the restaurant. Justin Park, the defending 2012 Mai Tai champion from the Manifest in Honolulu’s Chinatown, took home second place with his dramatic Lua Pele Mai Tai. Judges said his cocktail was delicious, and it incorporated 10 ingredients presented in a faceted highball glass atop a smoking wood-carved pedestal. Tim Rita from Monkeypod Kitchen on Oahu also placed with his Hana Hou Mai Tai that featured ginger, Maui lavender, absinthe and caramel foam with black sea salt. Chris Nevins from the Four Seasons in Wailea also made the top five. He says he makes up to a hundred Mai Tais a shift and tried to keep his recipe close to the classic. Oahu bartender Roxanne Siebert of the Republik placed third (and second in 2012) with her “One Night in Kona.” It featured a coconut gastrique, vanilla fernet branca, pineapple, orange and Sammy’s rum. 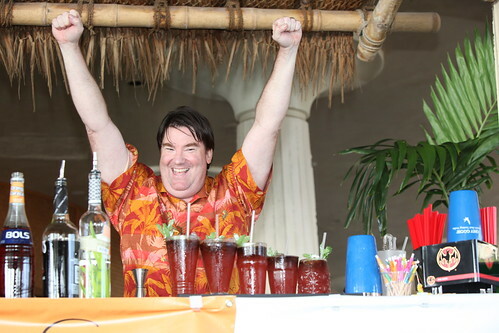 Dave Newman, the president of the Hawaii Chapter of the US Bartenders Guild, agreed to a point, though he also said that competitions like this bring enlightenment to the drink and the spirits culture in general. “Most of what we find in Hawaii are these overly sweet fruit juice concoctions that have all sorts of ingredients that do not belong,” Newman said. “Show me a bartender that can make a really good, classic recipe Mai Tai and I will show you a bar that I would like to sit at. Unfortunately, most of the hotels in Hawaii just flood the market with these ‘Mai Tai’s’–they really shouldn’t be called that–that have pineapple, OJ and grenadine in them. And if that wasn’t bad enough they are using really bad quality fruit juices, many which come out of a soda gun. So when people visit our islands they assume that’s what a Mai Tai is. Not sure how we got here, but I know a handful of bartenders that are doing it right and trying to spread their passion for our craft.